The striking appearance of succulents in any home will definitely give an elegant and classic decor. Not to mention, these are the most accessible plants, maintenance wise, preferred by many beginners. As they require little attention, is easy to overlook signs that might lead to a more serious problem. This was the case of rotten black stem on my succulents. And the main reason is simply overwatering. But there is no need to despair, keep reading. Here you will learn how to prevent and treat rotten black stem on succulents to immediately fix this issue. First off, look closely at the stem to see how much damage there is. The rotten black stem will show dark brown and black spots mostly on the lower part of the plant. Once you can identify the problem and the location, the rest will be easier. Because this is where the actual work begins. You will need to stop watering the succulents that have a black stem. Take it out from the pot immediately, discard of the soil and clean the pot very well. Make sure you rinse it completely and thoroughly so there is no fungus residue. Then, start cutting the black stem from the plant using a garden knife. Put aside the healthy plant and let it dry naturally for several hours. Moreover, make sure you keep it out of direct sunlight. Next, take a new pot and combine equal parts of coarse sand, soil, and peat moss. While doing so, make sure you don’t reuse the tools and materials you have with the infected plant. The following step consists of pouring roughly 2 inches of the mixture into the pot. 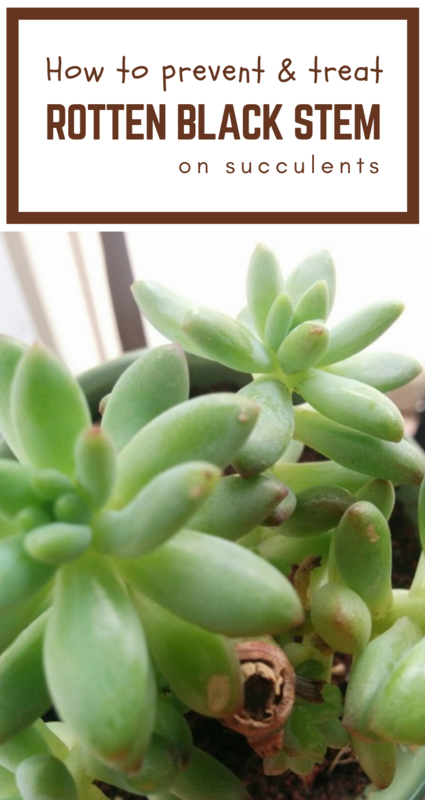 Place the healthy succulent into the pot and make sure the roots are lying on top of the soil. Then, fill the pot with the soil mixture until it reaches the base of the stems, firmly patting it around the plant. Lastly, place your plant in a very bright spot that also catches warm temperatures. In this stage, you only need to water the plant just a bit in order to moisten the soil. When the soil has completely dried out, you can water more thoroughly.